In case you hadn't heard or seen the explosion of chocolate bunnies everywhere, Easter is this weekend. 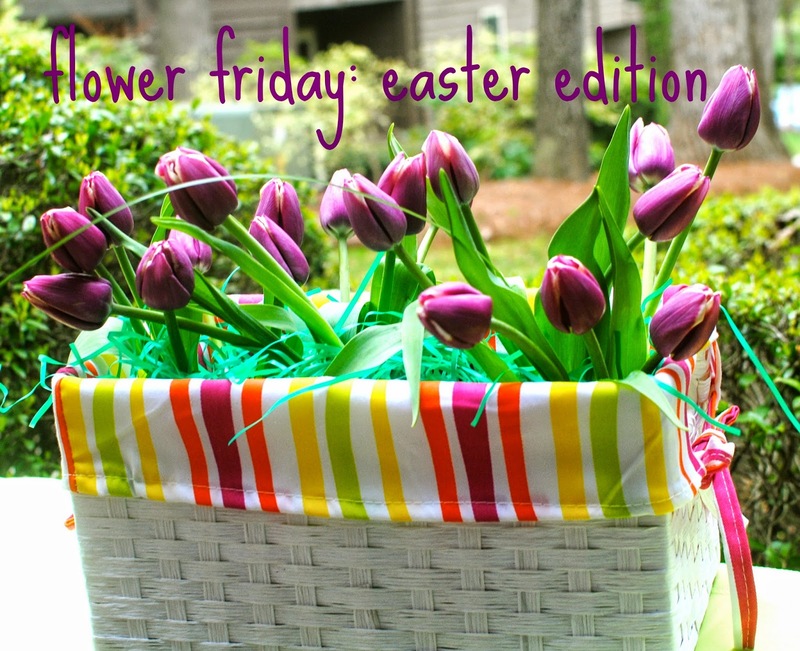 To celebrate, I decided to do an Easter edition of Flower Friday. In case you're new to Flower Friday, you can check out my first installment HERE. If you're like me, you've been hoarding Easter baskets and Easter grass for years. So lucky for me, I already had the perfect vessel for an Easter arrangement - an Easter basket, of course! I purchased purple tulips since they are the official flower of spring and got to work. Place your glass vases in the bottom of the basket and fill them with water. Cut your flowers and arrange them in the vases. Let the tulips do their thang and go every which way. The more natural the better. Some people like to take the leaves off tulips, I like to take some off but leave a couple for some girth. Yup, I just said girth. Use your Easter grass to cover the tops of the vases. It's a covert operation you see, we want the tulips to look like they are growing out of the Easter basket. Voila! Easter Basket arrangement complete and it took me all of 10 minutes! I hope you have a great Easter filled with family, fun and of course, chocolate bunnies. Easter Edition with the combination of flower is really good idea. The above pictures are looking awesome. This will sound good approach which you have shared with us. Hope this idea make the taste of easter double. Well! Now i want assignmentgeek service and at the same time happy to have such posts.